Takami Nieda is the recipient of a 2015 PEN/Heim Translation Fund Grant for her translation of GO, a coming-of-age novel that won Japan’s Naoki Prize and was adapted into a critically acclaimed film of the same name. GO provides a window into the life of an ethnic Korean student living in Japan, while being a testament to the universality of teenage experience. Read Nieda’s essay on translating GO here. 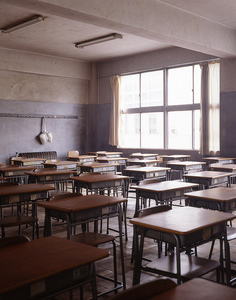 Some kid, a first year by the looks of him, stood outside the door, his bloodshot eyes darting across the classroom. It was only a week into the new school year. His eyes found mine and locked on. I decided to ignore him and casually shifted my eyes back to the molecular anthropology book spread out on my desk. He stepped inside. The lunch bell had just rung, so there were plenty of students still hanging around the classroom. They dug out what loose change they had in their pockets and began placing bets. The kid strode past the lectern and made for my desk in the back row, slow and deliberate. I closed the book, slipped it in the drawer of my desk, and kept one hand inside the drawer. The kid stopped, slightly right of center in front of my desk. He loomed over the chair where I was sitting. I raised my eyes and looked up at his face. He was grunting noisily through his nose. The boy looked nervous, ashen like a child before the start of a footrace. His chapped lips were pulled taut. Hurry up and hit me already, I thought. If he attacked me now, I didn’t stand a winning chance in my present position. Yet in every altercation thus far, not one of my challengers had made the first move. Not a single one. And because of this, I was known throughout the school as the reigning badass with a 23–0 record. The kid opened his mouth as if to speak, so I decided to cut him off. I was sick of hearing all the tired epithets. “I’ll make you famous,” I said, quoting Billy the Kid when he drew his guns. The kid said nothing, letting out only a shallow, puzzled sigh. He might as well have had a question mark floating above his head. I grabbed the palm-sized ashtray hidden inside my desk, and in one swift move, pulled out my hand and sprang to my feet. His eyes clouded with dark terror the instant they seized upon the ashtray. He managed to throw up his arms in defense, but I was faster. Like I said, you really ought to get in that first punch. I swung and smashed the ashtray against the bulge of his left brow—the supraorbital ridge, to be precise—with a little topspin. The skin there was thin and easy to cut. Right on the sweet spot. As the kid staggered back, his left hand went over his brow. His eyes were out of focus. He was frozen in panic. I could’ve finished him there, but I waited. I wanted everyone in the gallery to get a good look. Within seconds, blood was streaming from between his fingers. People usually react to seeing blood in one of two ways: lose the will to fight or pump themselves into a blood frenzy. I had no idea which way this loser would react and had no intention of gambling. I decided to finish him off. I drilled him in the soft part of the knee, putting my full weight into the kick. The kid crashed into a couple of desks and went down on his side. After pushing my desk aside to make some room, I kicked him in the stomach, again and again. Not with the tip but with the top of the foot. A toe kick is harder to pull back on and was liable to rupture the internal organs, not to mention it doesn’t make a sound. But with the top of the foot, it was easier to pull a kick, and a well-executed kick makes a thwack or whump sound, making it the perfect deterrent to scare away any would-be challengers in the gallery. I stopped kicking. He was curled up like a newborn baby, trembling. A terrible feeling of sadness came over me. Damn it if this poor kid wasn’t somebody’s precious child. After taking a breath, I slid my desk back to its usual spot. I put the ashtray back in the drawer, took out a tiny bottle of adrenaline solution from my bag and tossed it in the kid’s direction. Just a little of the stuff would stop the bleeding. Honestly, this act of pity wasn’t going to do me any favors in the future. The students in the gallery were sure to spread rumors that “Sugihara’s gotten soft,” which would bring all sorts of challengers like this kid out of the woodwork to take me down. But I think I’m in the clear. Today’s trifecta of ashtray, blood, and kicking was a pretty good show, so by the time school got out, the story would have blown up into something like brick, head trauma, and bawling. If the story settled about there, they’d be too spooked to challenge me until the start of summer break. I hated violence as much as Malcolm did. But sometimes you don’t have a choice. If someone strikes you on the right cheek, do you turn the other cheek? Hell no. Some jerks will bypass the cheek and hit you where it hurts. Even when you’ve done nothing to deserve it. They looked down at once. I slid the coins into my hand and left the classroom. As soon as I left, I realized that this was the first time I’d spoken to them. We’ve been in the same class for three years. I went to the cafeteria and bought myself some milk with one of the coins I’d just procured. Calcium is calming when you’re feeling worked up. The cafeteria was pretty packed, but I managed to find an empty seat at a long table and sat down. The others at the table quit talking as soon as I sat down. This was nothing new, of course, so I punched the straw through the milk box and drank my milk. Kato narrowed his eyes and stroked the bridge of his prominent nose with a loving finger. I was admitted to a private all-boys school whose rating was about as high as the calories in egg white. But to someone who’d been educated in Korean schools and studied less than a year for the entrance exams, getting in meant as much to me as if I’d been accepted to the University of Tokyo. One day about two weeks before the start of the term, I was summoned to the high school. I was shown into the office where the vice-principal and the teacher in charge of incoming first years asked me to “attend school under an alias so we don’t have any problems.” In other words, they wanted me to take a Japanese name and conceal my heritage, because going by my Korean name might get me bullied. Actually, these words never left my mouth. I did as I was told. Why, you ask? Because ever since I announced my intention to go to a Japanese high school, my Korean teachers really laid into me. One teacher called me an “ethnic traitor.” A turncoat. I’ve been called worse, but more about that later. Branded an ethnic traitor, I decided to thoroughly betray the ethnicity to which I belong. Even though I’d agreed to go by a Japanese name, I had no intention of hiding the fact that I was Zainichi. Not that I was going to pop off about it either. At least, I wasn’t going to do it. But just as you might expect from a second-rate school, the teachers were second-rate too, and they listed the name of my junior high school, which includes the words “North Korean,” unchanged, alongside my Japanese name, “Sugihara,” in the student register. The first challenger appeared before me three days after the entrance ceremony. Korean schools have always been seen as these exclusionary karate dojos crawling with thugs. A full-contact dojo, no less. Needless to say, that was just a stereotype. There are plenty of tender-hearted guys who would rather spend the day in a meadow twining poppies into necklaces. Then, there are the vicious types who find no greater pleasure than in fighting brown bears over spawning salmon in a raging current. I’d be willing to bet that Japanese schools have their fair share of both, but sadly, the bears in the Korean schools have been fed a belly full of prejudice. They keep feasting on that salmon, fattening up, growing more savage by the day. That frightening image is planted in the minds of the Japanese and takes root as the average image for all Koreans. So basically, to the students at my new school, I was a walking dojo signboard with the word “Korean” written across it. As in dojo yaburi—the practice of crashing a rival dojo and challenging its members to a match—if they beat me and returned with my signboard, they stood to score points with their pals. Stupid, I know, but then again I’m going to a second-rate school. What are you going to do? I’m not against that kind of primitive thinking. You either win or you lose, plain and simple. Everything made sense. The first challenger turned out to be Kato. Kato was a bona fide badass, whose father was a top lieutenant in a criminal organization. I was pretty fired up, given how it was my first match, and I broke Kato’s nose with an ashtray. Though I beat Kato easily enough, I was worried about what his father’s crew might do to me. Turned out to be a whole lot of worry over nothing. Kato saw his busted up face as an opportunity to get plastic surgery on his nose, which he never much liked anyway. After a while, Kato showed up one day with a sheepish smile, rubbing the ridge of his shapely nose and said, “Thanks a lot.” His father, who also seemed pleased with the result, said, “You gave my kid an upgrade,” and took me to dinner at an expensive restaurant in Ginza. Kato’s father was missing the pinky finger on his left hand. Kato was the first friend I made in high school and the only one I could call a friend. “How much are you selling these things for?” I asked, referring to the ticket. Kato smirked and said that it was a trade secret. Shoving the ticket in my pocket, I told him that I’d go if I was feeling up to it. A look of relief came over his face. Kato said, “I’ll see ya” and moved off the table. Kazuki Kaneshiro, a Japanese citizen of Korean ethnicity, made his literary debut with Revolution No. 3 in 1998, which won the Shosetsu Gendai Prize for New Writers. In 2000, Kaneshiro won the Naoki Prize for GO, announcing the emergence of a new voice daring to tackle largely unspoken issues of ethnicity and discrimination in Japanese society. The novel’s popular film adaptation in 2002 went on to win major awards in Japan. Many of his works have been made into films or manga, and Kaneshiro has been adept at working synergistically across multiple formats and genres, writing the original concept and scripts for the action thriller series SP and Border. Takami Nieda has translated into English works by authors such as Asa Nonami, Sayuri Ueda, Hiroshi Yamamoto, Issui Ogawa, Hideyuki Kikuchi, and most recently “Mummy” by Banana Yoshimoto in the anthology The Book of Tokyo: A City in Short Fiction. Her translations have also appeared in Words Without Borders and Asymptote. She is an assistant professor of English and translation at Sophia University in Tokyo.